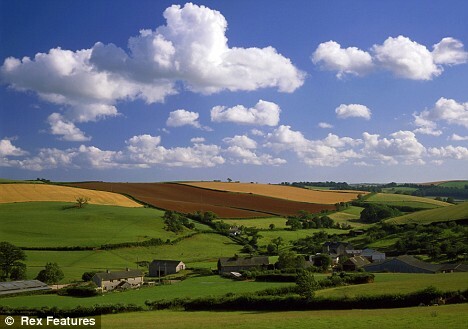 People in Britain will lose the right to sell land in acres under a new Brussels ruling nodded through by the Government. In a low-key meeting, a junior minister agreed last week to abolish the ancient imperial measurement and replace it with the metric equivalent ‘hectare’ from 2010. The UK previously had an opt-out, technically known as a ‘derogation’, from the EU’s use of some metric measurements, which allowed the continued use of acres for the pruposes of land registration. But from January 1, 2010, the unit, which dates back to the 13th century, will be banned. The decision was buried deep within the small print of EU directive 80/181/EEC on agriculture and fisheries and revealed by the Tories. ‘This is this kind of pointless interference into the nooks and crannies of our national life that frustrates people about the EU,’ said shadow Europe minister Mark Francois. ‘Whether we use hectares or acres should be a matter for Britain to decide, not the EU. ‘Once again this weak Labour Government has meekly given up yet another of Britain�s rights to Brussels. Successive British governments have been under pressure from Brussels to announce a date for phasing out imperial measures altogether, with the latest deadline set for 2009. Last year, however, the European Commission and Parliament announced that it would no longer be seeking their extinction. It followed campaigns by Britons dubbed ‘Metric Martyrs’ who have fought for years to stop the march of new measurements from Europe. In 2001, Sunderland market trader Steve Thoburn was convicted of selling bananas by the pound. He died in March 2004, aged 39, just days after learning his appeal to the European Court of Human Rights had been rejected. But the move consigning the acre to history – rubber stamped by Jonathan Shaw, Parliamentary Under Secretary of State for Marine, Landscape and Rural Affairs – will alarm those who believe many eurocrats are still intent on forcing Britain to swap the pint for the litre, ounce for the gram and mile for kilometre. Neil Herron, campaign director of the Metric Martyrs Defence Fund, told the Mail: ‘This is what happens when you allow yourself to be ruled from Brussels. We are being governed by people we cannot remove from power and have a weakened Parliament in Westminster. An acre is equal to 4,840 square yards or 43,560 square feet. A hectare is more than twice the size at about 107,639 square feet. The first law setting out an exact statutory size for the acre was passed under Edward I’s reign between 1272 and 1307. The word is derived from the Latin ‘ager’, from which we also have words like agriculture. Public consultations launched by the commission, which confirmed that allowing imperial measures to be used alongside metric measures would not disrupt trade and commerce – and would help to counter anti-EU sentiments. But loose goods still have to be sold in metric quantities, with imperial measures only allowed to be displayed alongside, rather than instead of, them. No one from the Department of Environment, Food and Rural Affairs was available for comment. Remember the woman who was in trouble for selling by the pound? History shows that people usually don’t know when we are about to win. We are lousy at knowing whether we have a chance at victory. Well, for one thing, it is impossible to know what’s going on in the other camp. The oppressors might seem invincible, but there are often schisms and rifts which are tearing the enemy apart from within. The bad guys might be extremely vulnerable because they are busy fighting with each other. They might be merely putting a false public image of unity . . . one which is dropped the minute the cameras stop rolling. In addition – as I learned as a kid in karate class – even the toughest opponent has vulnerabilities. No matter how big the lug you’re fighting is, hit him in one of his vulnerable spots, and he’s going down. In struggles for freedom and justice as well, if you identify and focus on the bad guy’s vulnerabilities, you can win no matter how poorly the fight seems to have been going. Moreover, the opponent might be affected by what we do a lot more than we realize. You’ve seen it in horror and martial arts movies. The good guy has given his best shot at the monster. But the monster doesn’t seem to be fazed in the least . . . he glowers and starts walking threateningly towards the good guy, who is flat on his back. It seems like the good guy is finished. There is often a lag time between what we do and our ability to see the effect on our opponents. It may be that our activism is having a tremendous effect and is pummeling the forces of tyranny, but that the weakened and wounded tyrants are simply bluffing and putting on a strong front to keep us intimidated. Don’t stop fighting just because the effects of our actions haven’t yet become visible. In addition, it is often difficult at any given time to see which historical trend will end up being the most important one. In other words, there are always competing trends and forces, and something which doesn’t seem very important at the time can end up winning the battle in the long-run. As just one example, the Soviet Union collapsed partly because Russians watched images of prosperity on American tv, and decided they weren’t going to put up with what they had. The communist leaders didn’t think that letting in American tv programs would have such a huge influence on their population’s willingness to put up with communist repression. But it did. Bottom line . . . don’t quit now. The people who have systematically sold Britain to the EU are traitors, and the banning of selling by the pound and now the acre are the latest outward symptom of this deeply offensive trend that is wrecking this country. It WILL come to an end, and ALL the bad legislation and the insane treaties that have been introduced to destroy Britain will be repealed and nullified respectively, leaving us once again in a place worth living in. For now, it is your duty to sell by the pound and by the acre and by the foot or by the pea weight if that is your desire. Private transactions are exactly that, PRIVATE and the state, any state, has no business interjecting itself into your exchanges of goods and services. This entry was posted on Monday, July 21st, 2008 at 10:33 am	and is filed under Insanity, Money, No no no!, Politricks, Post Tipping Point, The Law, Told You So.